The new water and electricity bills are equivalent to a surcharge of 194 per cent at a time when oil prices are going down, Labour leader Joseph Muscat said yesterday. “Someone who consumes €100 worth of electricity will have to pay a bill of €294,” he told a huge crowd that attended a manifestation against the tariffs hike. He said the increase came at a time when the surcharge should have started going down, from 95 per cent in the past months to 61 per cent at the end of October. 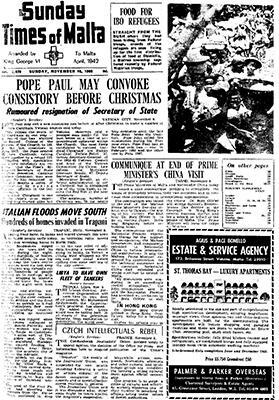 Moreover, backdating the new rates undermined the country’s credibility. 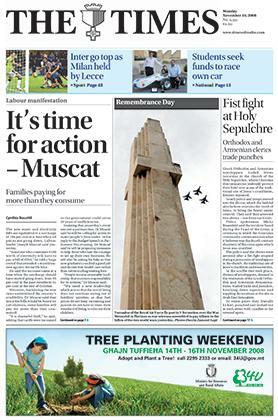 Dr Muscat said that since the bills would be based on calculations, some families will pay for more than they consumed. “It is shameful theft,” he said, adding that tariffs were increased so the government could cover 20 years of inefficiencies. Insisting that yesterday’s event was not a partisan one, Dr Muscat said he will be calling for action to make people’s lives easier. In his reply to the Budget speech in Parliament this evening, Dr Muscat said he will be proposing measures to help those who had the courage to set up their own business. 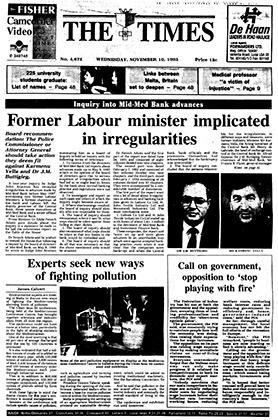 A four-year inquiry by Judge John Anastasi has revealed irregularities in advances made by Mid-Med Bank before May 1987, mentioning two former Labour Ministers, a former chairman of the bank and Labour MP, the deputy governor of the Central Bank, three senior executives of Mid-Med Bank and a senior official of the Central Bank. Prime Minister Dr Eddie Fenech Adami gave details about the inquiry in a statement he made as he laid the voluminous report on the Table of the House. Environmental experts are meeting in Malta to discuss new ways of fighting the Mediterranean alarming levels of pollution. The Clean Seas 93 conference, being held at the Mediterranean Conference Centre, has brought together scientists and industrialists from all over the region. The conference could not have come at a better time, particularly in the light of shocking statistics about the Mediterranean. The police in Gozo, led by Supt. Joseph Cachia and Inspector S. Galea yesterday recovered the body of a man from the sea at Xatt l-Aħmar near Fort Chambray, Gozo. The body was sighted by some people living in the area early in the morning. The police attempted to tow the body behind the boat but it was found advisable later to catch the body in a net to take it ashore. The man was wearing light brown shorts and a watch: he has not yet been identified. In all probability this is the same body reported nine days ago by fishermen off Dwejra, Gozo, and also the one which was sighted by Dr H. Copperstone while fishing a few miles off Dingli Cliffs two days earlier. The police had carried out a search after both reports but had failed to find the body. The amount of money collected during the Penny Stunt, the main activity of the National Students’ Charities Campaign held last weekend, amounted to £416 while the door-to-door collection held during the same days amounted to some £950.